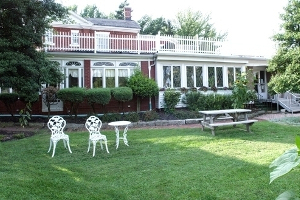 Hellriegel's Inn has long been a popular place for Reunions. See more about Hellriegel's Inn here. From the Hellriegel's Website: HELLRIEGEL'S is located on Cherry Farms Estate with banquet facilities for complete formal sit down affairs to informal buffets in our banquet facilities that accommodate 10 to 200. With outside facilities for picnics, weddings, class reunions, family reunions, golf outings and company parties on a seven acre estate with bathroom facilities and shelter. Our facilities include a beautiful patio, surrounded by flowers and plants, that will enhance your dining experience.